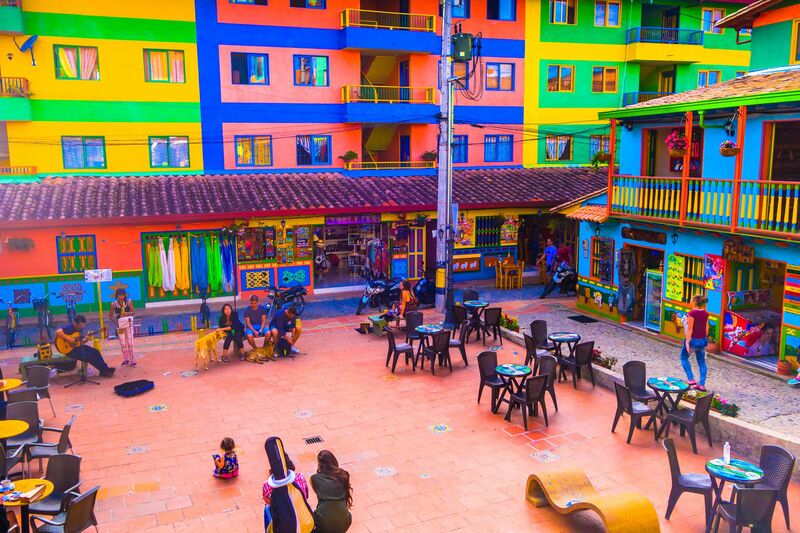 The 23 most colorful cities in the world - Stephen P. Wald Real Estate Associates Inc. Colorful houses and boats in Burano Island, Italy. [Curbed] If the gray of winter has you feeling a little gloomy, we’ve got a solution: Let your imagination stray to the vibrant locales of far-off places. Nothing stokes wanderlust quite like a colorful photo, and some of the world’s most beautiful cities are awash in turquoise, lavender, golden yellows, and more. Whether it’s a street with every color of the rainbow or an entire town decked out in monochromatic blues or pinks, the colors of a place can leave a lasting imprint on our travel memories. It also makes trip photographs—here’s looking at you, Instagram—the envy of all your friends. We’ve rounded up the 23 most colorful cities and streets outside the United States with a special emphasis on unique spots you might not already know. Sure, we’ve included a few standard entries (Saint Basil’s Cathedral, for one), but there are plenty of sherbet-colored cities on this list that will hopefully inspire you and leave you hungry for more. Travel never looked so good. 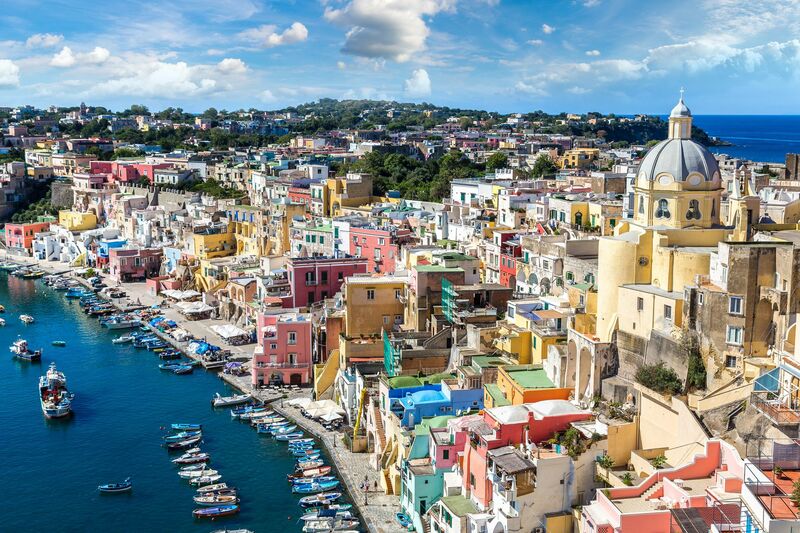 The colorful seaside town of Procida, Italy. The hikeable villages of Cinque Terre are better known than Procida, Italy, but this under-the-radar island off the coast of Naples is just as pretty. Narrow streets are accompanied by sherbet-colored buildings that rise above sparkling waters. The most spectacular colors are in Marina Corricella, where lore has it that fishermen painted their houses in bright colors so they could recognize them from the sea. The all-blue streets of Chefchaouen, Morocco. 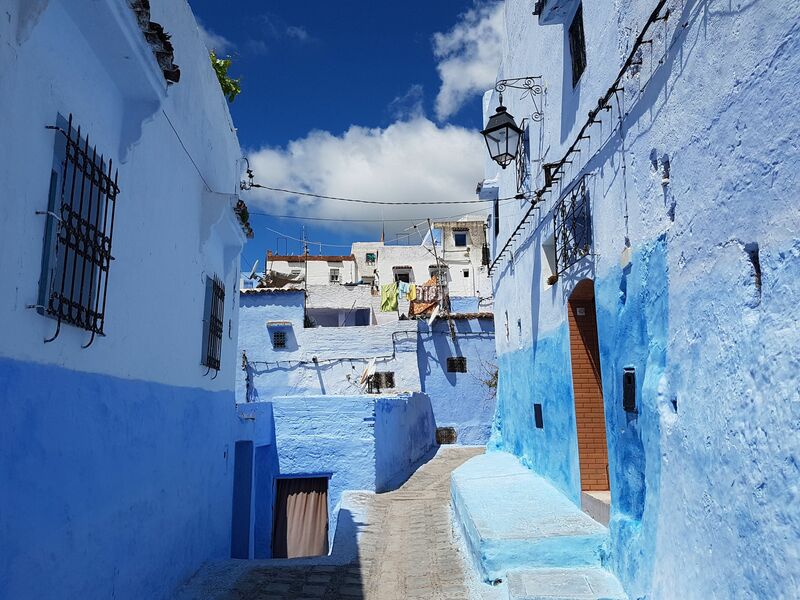 Located in Morocco’s Rif Mountains, Chefchaouen is often better known—thanks to Instagram and Pinterest—as the “Blue City.” The cobblestone streets and passageways are framed by historic buildings all painted in varying shades of cyan, powder blue, and periwinkle. Theories abound about why residents chose blue; some say it’s in order to combat mosquitos, while others say Jewish locals fleeing the Spanish Inquisition used blue paint to symbolize the sky and heaven. Signs densely line an alleyway in Kabukicho, Tokyo. With a population of over 9 million, Tokyo is one of the world’s busiest and most colorful cities. 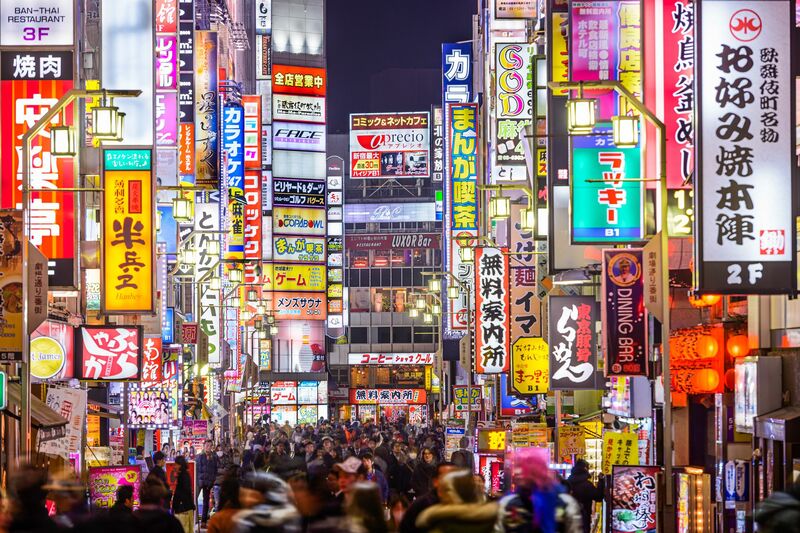 Head to neighborhoods like Kabukicho, a famous entertainment and red-light district, and you’ll find thousands of neon signs and an energy that never sleeps. 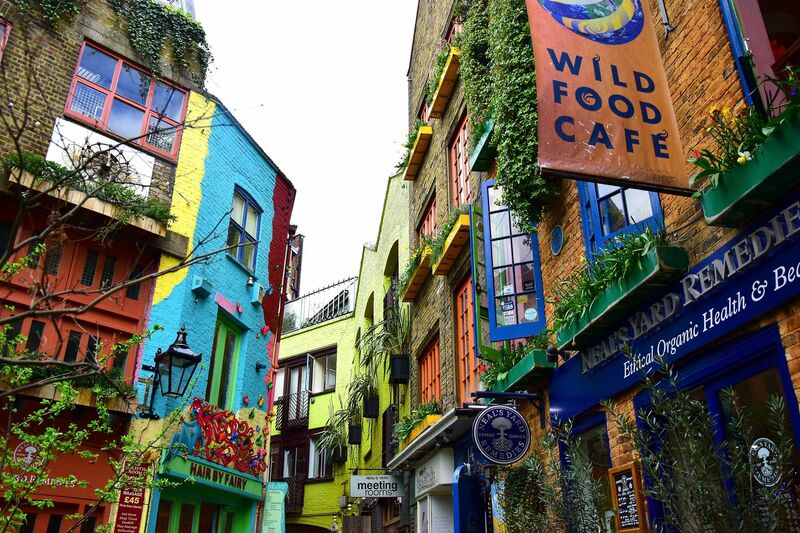 A small alley in the Covent Garden area of London, Neal’s Yard is surprisingly colorful. Away from the London hordes in a small alley in Covent Garden, Neal’s Yard is a dramatic departure in a city most often characterized by the color gray. A hidden courtyard boasts painted bricked buildings, orange and blue shutters, and murals accompanied by winding vegetation. Saint Basil’s Cathedral in Moscow, Russia. Located in the Red Square in Moscow, Russia, Saint Basil’s Cathedral originally contained 10 churches but now functions as a museum and national landmark. Its candy-colored domes are one of the most recognizable tourist sites in the country. The village of Taichung, Taiwan, is covered in colorful public art. 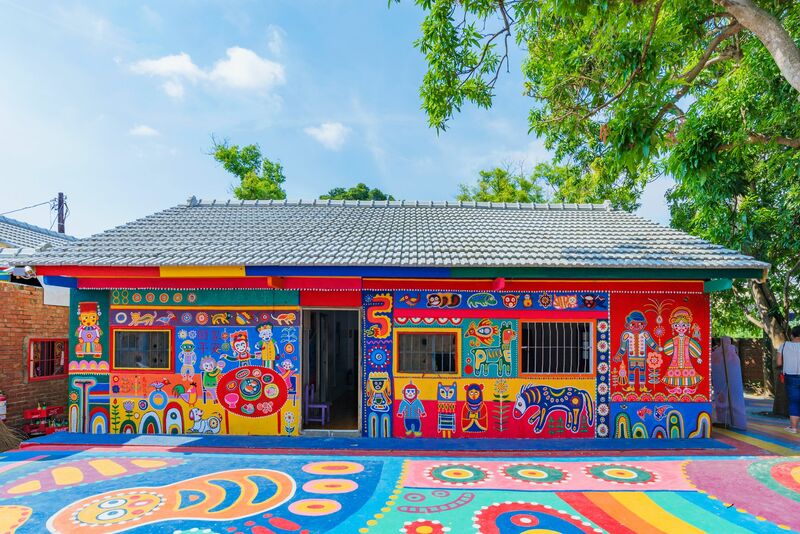 Formerly a residential area for ex-members of the military, what is now called Rainbow Village in Taichung, Taiwan, was set to be redeveloped. But before the wrecking balls descended, local resident Huang Yung-Fu decided to transform the drab, concrete neighborhood into a colorful display of public art. Yung-Fu’s efforts saved the village, and the neighborhood is now a designated cultural area that sees over a million tourists each year. 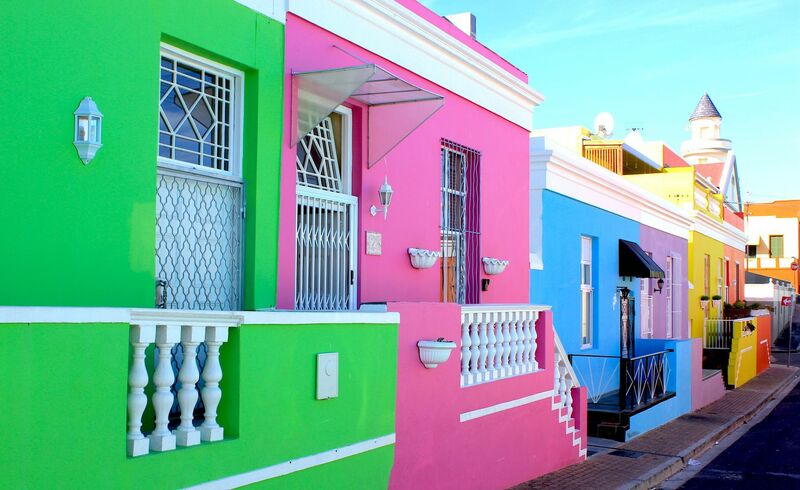 Rows of colorful houses in Cape Town, South Africa. Featuring a mix of Cape Dutch and Cape Georgian architecture, Bo Kaap is one of the oldest residential areas in Cape Town, South Africa. Today, it’s also one of the most photographed areas of the city thanks to its brilliantly colored homes and cobbled streets. 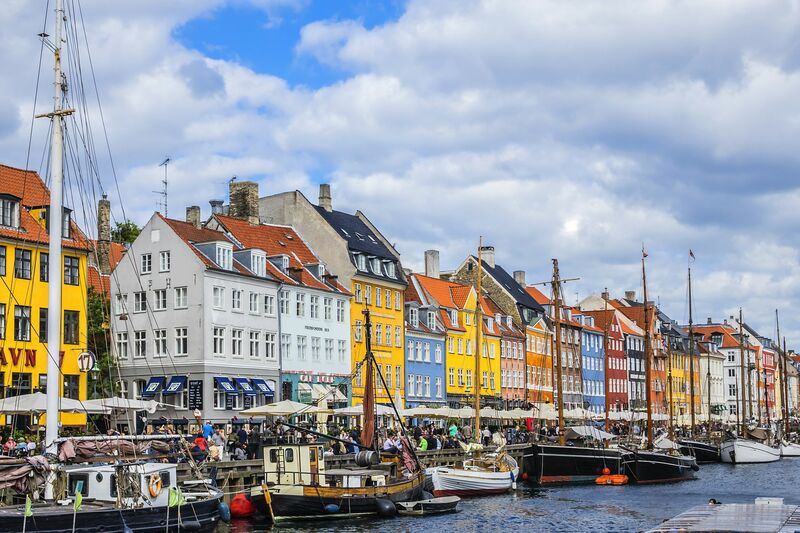 Copenhagen’s famous Nyhavn pedestrian waterfront features rows of brightly painted hosues. Copenhagen’s Nyhavn was originally a busy commercial port with ships from all over the world. Today the striking yellow, orange, and blue houses—some dating back to 1681—have been renovated, and high-end restaurants fill the old port. 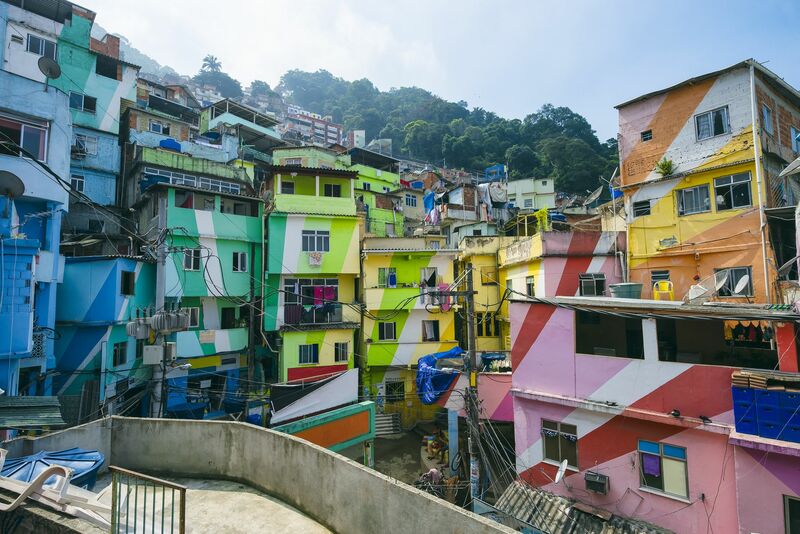 Colorful painted buildings in Santa Marta favela in Rio de Janeiro. Probably the most famous favela in Rio de Janeiro, Santa Marta boasts colorful murals that cover over 75,000 square feet of public square. The design features an explosion of rainbow-colored rays of sunshine striped over 34 houses. It was organized by the Favela Painting Foundation, and the team hopes to paint even more in the future. 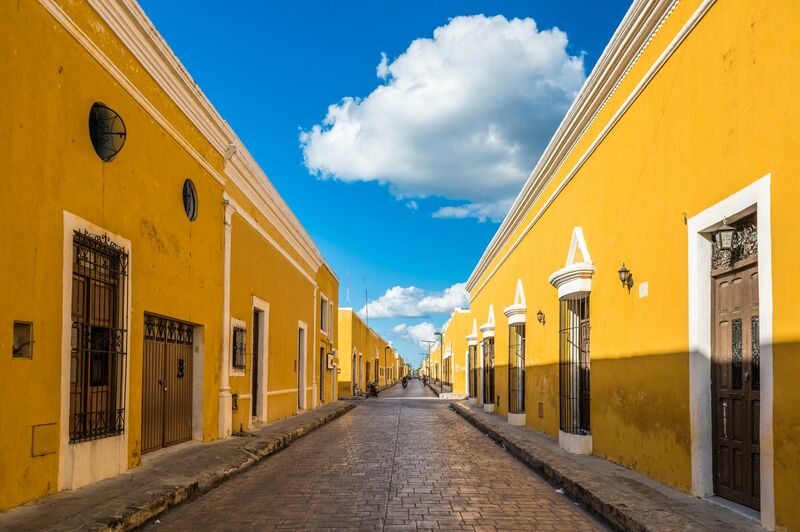 Izamal, the yellow colonial city of Yucatan, Mexico. This small cobblestoned city may not feature every color in the rainbow, but its vibrant yellow buildings earn it a spot on the list. The canary-colored 16th-century monastery at the center of town was built on top of a Mesoamerican temple, and the color yellow continues to pay homage to the region’s Mayan roots. 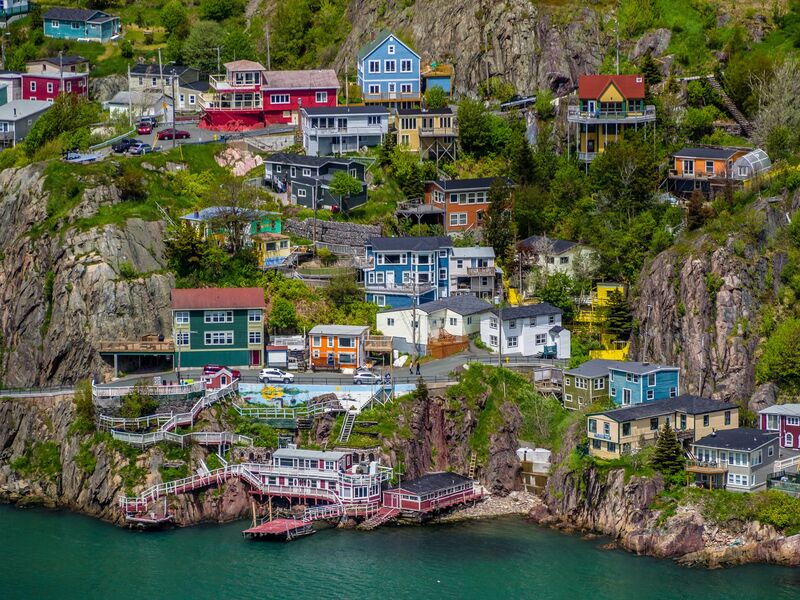 An aerial view of the colorful houses built on the rocky slope of Signal Hill in St. John’s Newfoundland, Canada. With the goal of reviving downtown in the late 1970s, the originally dull Victorian row houses of St. John’s, Newfoundland, were repainted in vibrant colors. The idea caught on with locals and now the entire area is a mish-mash of brightly painted red, blue, and green buildings, all with contrasting trim. 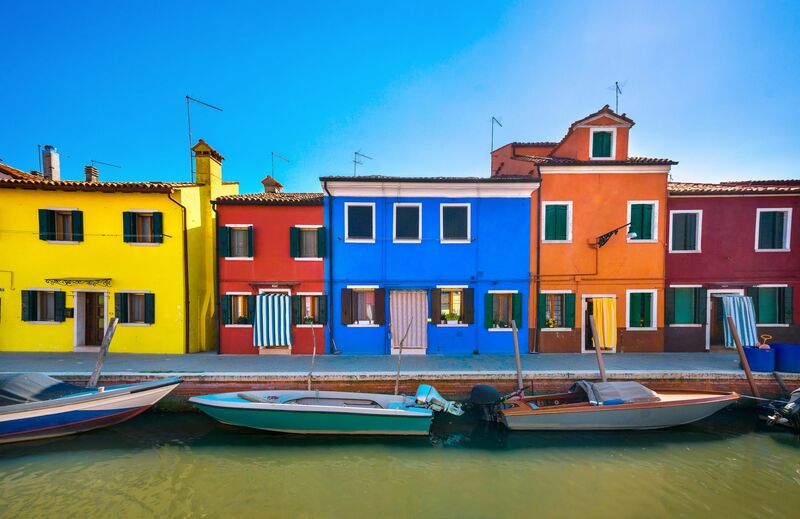 Whether for Instagram or for all the tourists, residents of Burano, Italy, repaint their houses every two years. It’s a tradition that’s made this island in the Venetian Lagoon famous. Legend has it that local fisherman liked to see the bright colors on their way into town, and the residents also use the bright paint to delineate where one property begins and ends. Historic Tan Teng Niah Residence, a colorful Chinese building located on Kerbau Road, in the heart of Singapore’s Little India. 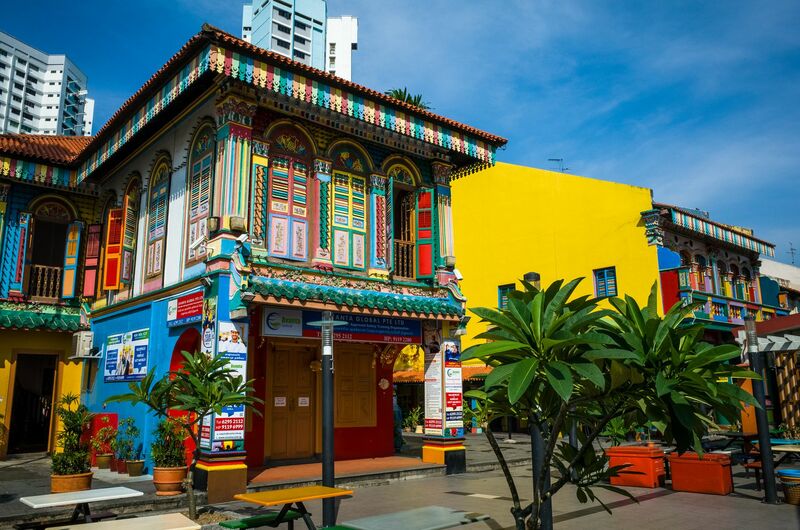 Whether you visit the Sri Veeramakaliamman Hindu temple or the Chinese House of Tan Teng Niah, Singapore’s Little India is one of the most colorful neighborhoods in the country. Colors in every shade can be found on intricately patterned buildings or in the tiny colorful statues that blanket the exteriors of holy temples. 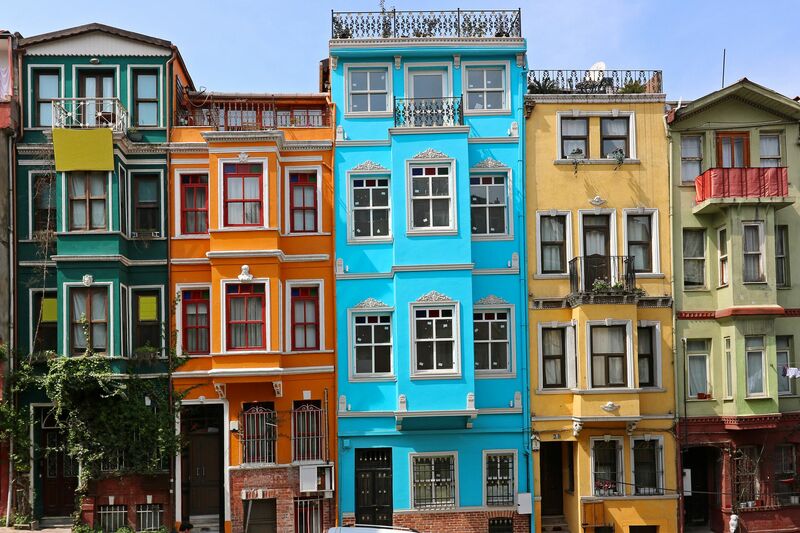 Colorful houses in Balat, the old city of Istanbul. Off the beaten path in Istanbul, the colorful houses of the Balat and Fener neighborhoods are examples of the historic communities in the city’s Jewish and Greek quarters. After falling into disrepair in the 1960s and 1970s, the neighborhoods are now on the UNESCO World Heritage List and many of the brightly-painted houses have been renovated. 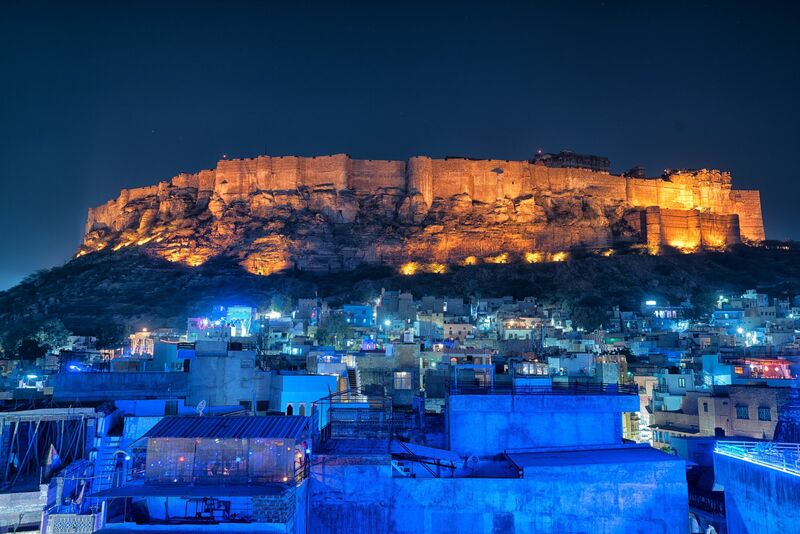 The blue city of Jodhpur with the Mehrangarh fort in the background in Rajasthan, India. Another entry in the “all-one-color” category, the Indian city of Jodhpur is a winding maze of blue-box houses, all situated under the imposing fort of Mehrangarh. Once used to indicate social status, the indigo pigment is a stark contrast to the surrounding desert and looks particularly magical at night. The pastel-colored buildings of Old San Juan, Puerto Rico. 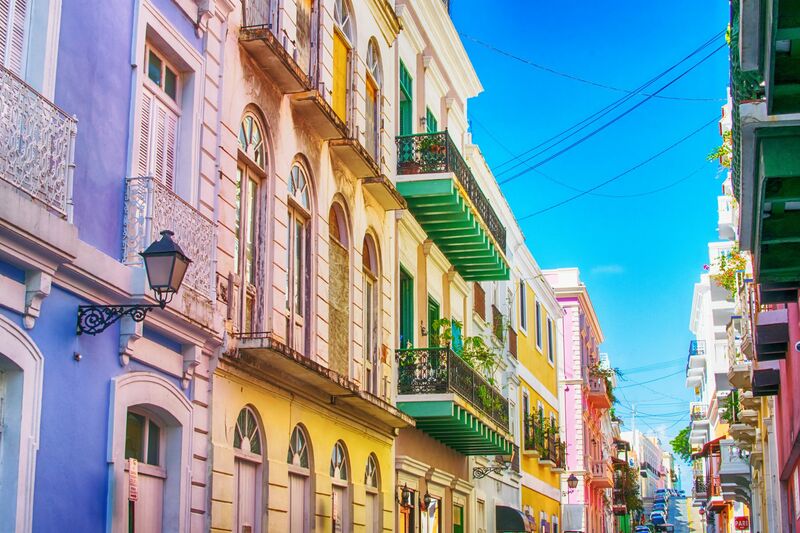 Walk through Old San Juan, Puerto Rico, and you might never see the same color twice. From lavenders to lime greens, the buildings are a soothing and photogenic complement to the historic city’s cobblestoned streets and picturesque seaside panoramas. 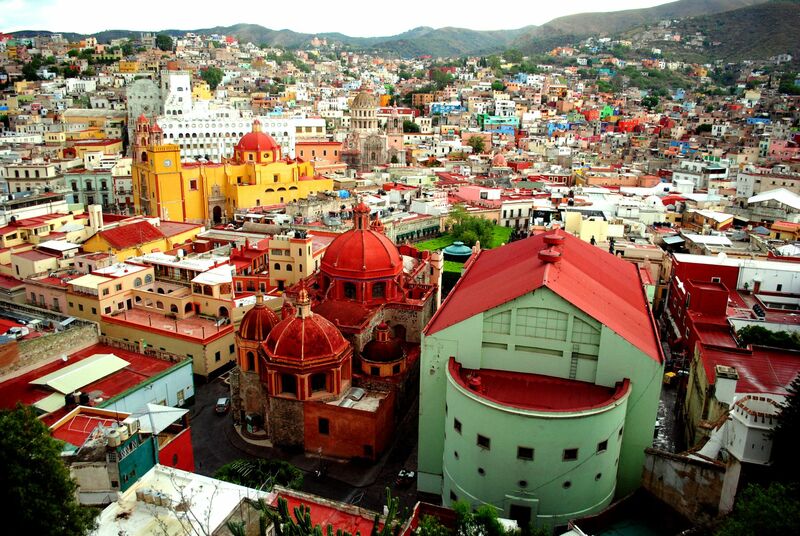 An aerial view of the town of Guanajuato, Mexico. Another UNESCO World Heritage site, Guanajuato, Mexico, is a colorful feast for the eyes, with green, red, yellow, and orange buildings dotting the downtown streets and the surrounding hills. Narrow streets, Baroque and neoclassical buildings, and the red and yellow Cathedral Basilica Nuestra Señora de Guanajuato make this one of Mexico’s most captivating cities. 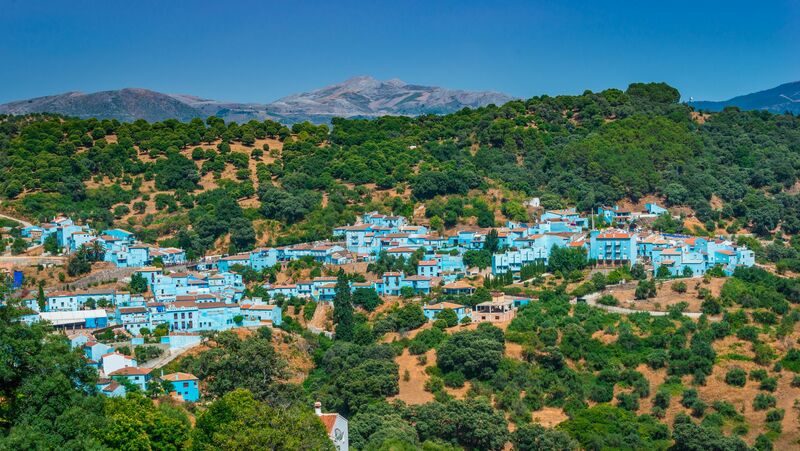 The all-blue “Smurf” town of Juzcar in Andalucia, Spain. While other cities were painted blue for religious or practical reasons, Juzcar, Spain, went all-blue in the summer of 2011 as a promotional campaign for the Smurfs movie. Although the move was meant to be temporary, the idea was so successful in attracting tourists that locals voted to keep the distinctive coloring. The historic city center of Menton, in the French Riviera. 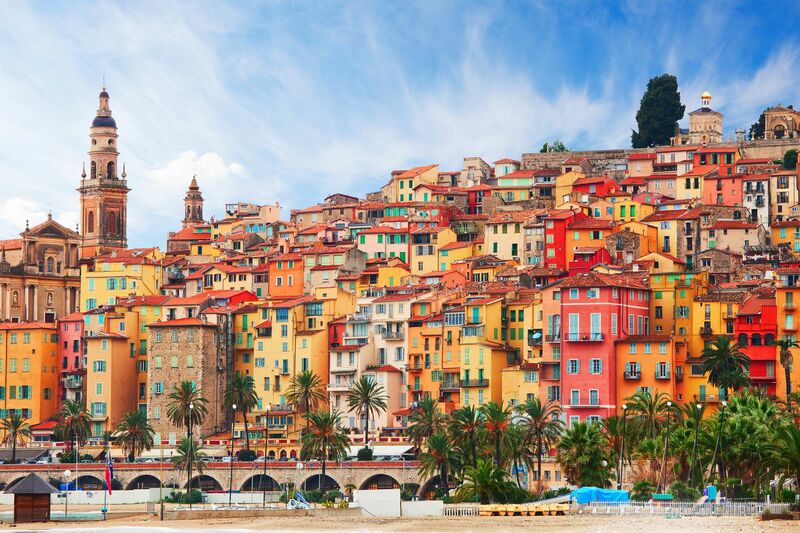 This relatively small town of 30,000 people on the French Riviera may not have the same pizazz as its neighbors, but Menton’s gold-, salmon-, and cherry-colored buildings make it just as appealing. Throw in the terra-cotta roofs and you just might never leave. The city square of Guatapé, Colombia. Often referred to as Colombia’s most colorful town, Guatapé boasts enticing, colorful squares like the Plaza de Zocalos and painted doors, windows, and shutters everywhere. Don’t miss the fresco-like illustrations decorating houses; you’ll find everything from shapes and patterns to endearing paintings of animals. Colorful houses on a cobblestone street in Sighisoara, Romania. 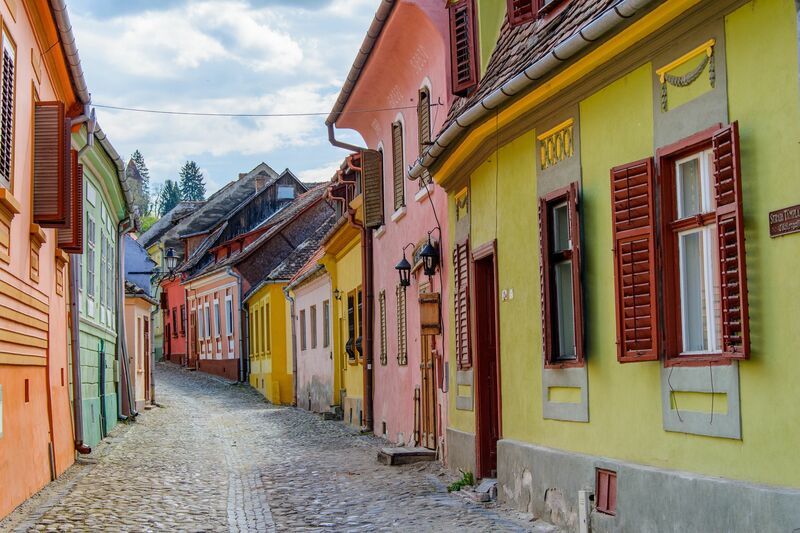 Located in the historic region of Transylvania, Sighisoara may not be on the radar of many travelers, but that’s a shame. This pedestrian-friendly medieval town features vibrantly colored buildings in yellows, pinks, and greens that are just begging to be photographed. Wander the cobblestoned streets and then enjoy the views in one of the town’s many restaurant-filled squares. 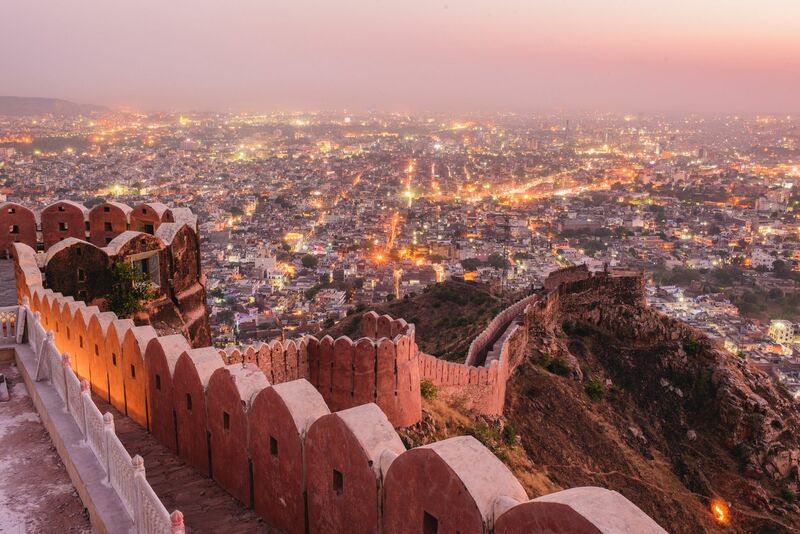 The view from Nahargarh Fort in the pink city of Jaipur, India. While many cities have been painted blue, Jaipur, India, is one of the few cities in the world that’s predominantly pink. According to local lore, King Sawai Ram Singh had the city painted pink in 1876 in preparation for Prince Albert and Queen Victoria’s visit to India. Since then, the entire city has maintained its terra-cotta pink coloring, much to the delight of Instagram-happy travelers. The brightly colored buildings in Curacao.